In the valley of lovely Glenveagh..."
Deep in the Derryveagh mountains, there's a piece of Donegal that owes its existence largely to America. Glenveagh castle and its exotic gardens, which rise like an apparition over Lough Veagh, were built in the 19th century by John George Adair, a man who was born in County Laois, but who made his fortune in the United States. He had a castle designed to resemble Balmoral, Queen Victoria's Scottish highland residence, with a four-story keep and turrets made of thick granite, and placed it in estate of over 40,000 acres. Two other Americans who later owned the castle would add to it’s size and grandeur, creating one of Europe’s most enchanting settings in a place of solitude. Adair, born in 1823, came from a family of minor landed gentry, and made his fortune by adventurous land speculation. His first sight if Glenveagh in 1857 bowled him over. He was "enchanted by the surpassing beauty of the scenery" and purchased several tracts of land which together formed the new estate. Adair married Cornelia Wadsworth of Genesco, New York in 1869 (her father had been a Union general during the Civil War). After Glenveagh castle was completed in 1873, the couple spent more and more time in America, developing new business interests in Colorado and Texas. In 1885, on the way back to Ireland from Texas, Adair died suddenly in St.Louis, Missouri. Upon inheriting Glenveagh, Cornelia added a new wing and round tower to the building, and brought a kinder style of management to the estate. She planted shelter-belts of Scots Pine and Rhododenron and laid out "Pleasure Grounds," as gardens in Victorian times were called, which were distinct from the working kitchen gardens. While her late husband had caused intolerable misery by driving his tenants off the land, Cornelia was renowned as a kind landlady and a generous helper of the poor. During the first World War, she used the castle to house wounded Belgian soldiers. Cornelia Adair continued to spend time at the castle until 1916. She died in 1921 at the age of eighty-three. In 1929 the Castle was sold to Arthur Kingsley Porter, a Harvard professor of Fine Arts from a wealthy banking family. Porter came to Glenveagh to study Irish archeology and culture, eventually publishing a volume called "The Crosses and Culture of Ireland." 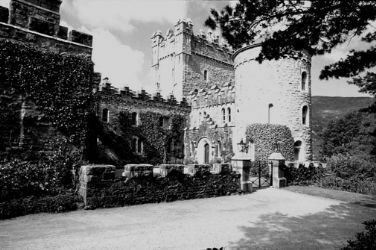 He and his wife Lucy did repairs on the castle and estate, and entertained Irish literary and artistic personalities of their day. Unfortunately, in 1933, while staying on Inishbofin island with his wife, Mr. Kingsley Porter took a walk on the shore one day and disappeared. He was presumed drowned. The following year, his wife leased Glenveagh for the summer to a Mrs McIlhenny from Philadelphia and her son Henry. In 1936, Henry returned and bought the estate. His grandfather, John, had originally come from Carrigart, north of Glenveagh, emigrated to the USA and amassed a fortune, largely through his invention of the gas meter. (Another member of the McIlhenny clan came up with an equally notable invention: Tabasco sauce!). Henry's father, John, was also a successful businessman who collected art and served as president of the Philadelphia Museum of Art. Following in his father's footsteps, Henry built an impressive art collection of his own. Henry McIlhenny loved entertaining. Each week, his chauffeurs drove to Shannon and Belfast airports to collect guests for his house parties. Greta Garbo, Rosemary Clooney, violin virtuoso Yeheudi Menuin, jazz king George Melly and English artist Derek Hill were just some of Glenveagh's guests. Henry brought about a glorious return to the "big house" lifestyle with picnics, deer-hunting parties, afternoon teas and formal dinners. Guests were graciously looked after by a staff dressed in Austrian-styled uniforms designed by the host. Henry himself was, according to one guest, "A fine looking man, well made and tall, and an affable host." Carmel Brady, Glenveagh's long-serving Head Guide, agreed: "Mr. McIlhenny was mannerly, jolly, and very nice to the staff. In those days, there would have been twelve indoor staff, with eight more men for the gardens. The lifestyle was lavish, with frequent dinner parties, and lots of daytime activities for his guests to enjoy: deer-stalking, fishing in the lough, the heated swimming pool at the lakeside and, of course, the wonderful gardens." The surrounding contrast of craggy mountains and rugged bogland makes Glenveagh's lush gardens even more striking. Henry made the estate the focus of his life for thirty-six years. Besides restoring the castle and furnishing it with treasures, he completely re-developed its gardens. With the help of renowned English nursery man James Russell and New Jersey garden designer Lanning Roper, he brought in exotic plants from as far afield as South America, Tasmania and China. He enhanced the layout first created by Cornelia Adair, adding a formal Italian garden, another walled garden, and a neo-Gothic conservatory, among other things. He also created a stairway to a high grassy platform that offers a breathtaking view of the castle in its lakeside setting. The castle's interior is entrancing. Each room has its own decor, to complement its function: A spacious drawing room with George III furniture and wonderful paintings, an elegant dining-room with specially-commissioned tableware and magnificent Landseer canvasses, a music room with an Irish harp dating to the 1800's and the library, with stunning views of the lake. The bedrooms also have varied decoration. My own favorite is the American-styled oval Blue room, with pale oak and satinwood chosen by Cornelia Adair. Access to the interior is by guided tour only. The atmosphere of Glenveagh draws you in and leaves a strong impression in your memory. The lake setting, painterly light and the wonderful scent of the garden plants are all delightful. But Henry McIlhenny's way of weaving the threads of Glenveagh's past together is what makes the overall impression more than the sum of its parts. As Head Guide Carmel Brady says, "You could really call him a creator. His vison of how Glenveagh could be was in his mind's eye, and over the years he created it, like a well-finished work of art." In 1975 Henry McIlhenny agreed to sell the Glenveagh estate to the Irish government, allowing for the creation of a National Park, and then in 1983 gave the castle and gardens to the Irish Nation. He died in 1986 in Philadelphia. Just a few months later the castle was opened to the public, and visitors from all over the world began to enjoy his remarkable vision. Location: 24 kilometers north-west of Letterkenny. Kilmacrennan/Termon to Dunlewey road, or the Churchill to Dunlewey road. Opening Hours: March to Early November: Daily:10.00-18.30. Last admissions 17.00. Castle tour: Euro2.75-adults; 2.00- Senior Citizens; 1.25-Students/children.7.00- Family. Bus to Castle: Euro2.00 Euro per adult. 1.00 concession. Garden and Parkland access: Free of charge. Visitors Centre: free exhibitions, information, and a 45 minute audio-visual presentation. Restaurants: Visitors' Center and Castle Tea-room. Wildlife: Glenveagh National Park has reintroduced Golden Eagles, originally native to the area, and has a vast range of breeding birdlife, as well as red deer, foxes, badgers, otters, goats and mountain sheep. Nature trails allow visitors explore the area.